Situated within the popular Old Bazar in Ohrid, close to the 900-year old Plane Tree Cinar and the fountain on Krusevska Republika Square, Ali Pasha Mosque is a noticeable building with long history. The Mosque was built in 1573 by Sulejman Pasha, although it was a sacred place at the same time it served as a religious secondary school. During its existence it was several times restored and many changes were made. Although, changed it still possesses charming beauty and the splendid architectural style can still be noticed today. Nowadays, the Ali Pasha Mosque in Ohrid is a beautiful and significant religious monument which remembers the time when Macedonia was under the control of the once powerful Ottoman Empire. 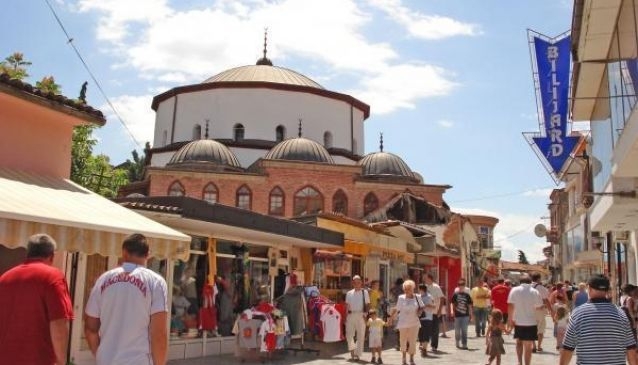 Visiting the Mosque you will have a chance to see outstanding building, with rare architectural style and at the same time you will have an opportunity to discover significant facts about this historical building and the history of Macedonia as well.